PhytoChemia's Blog: GC Analysis - Part V. FID or MS for Essential Oils? GC Analysis - Part V. FID or MS for Essential Oils? An important task of analytical chemistry is to select the detector that best suits the purpose of an analysis. Each detector has indeed its pros and cons. In the area of ​​essential oils, FID and MS (in total ion monitoring mode) are both commonly used, and not always wisely. Unfortunately, the difference between them is rarely explained to customers and consumers, and they are even falsely presented as being equivalent. I will try to address the issue here. Table 1 compares some characteristics of both detectors. In general, the MS should be preferred for qualitative analysis (identification of molecules when in doubt), and the FID for quantitative analysis (determining the percentage of each compound in an essential oil). However, we often encounter essential oils analysis reports with concentration percentages obtained solely from MS detection, which is not a good practice. First, you should know that chromatograms obtained by MS usually are "total ion chromatograms"(TIC), obtained by summing up the number of fragments obtained when analysing a molecule. If a molecule breaks down easily, its TIC signal will be intense, while a "robust" one, producing few ions, will provide a weaker signal. This leads to discrepancies between the observed response factors* (1). As I mentioned in a previous post, the FID response factor is not the same for all molecules, but it is more consistent, reducing quantification biases. Let us see how this works in practice. I prepared a solution of a number of different types of volatile molecules at known concentrations. I thus could determine their absolute content as a percentage of the total mass of volatile compounds of the sample (Table 2). I then injected the mixture with the same temperature program on GC-MS and GC-FID and integrated the two chromatograms. I finally computed the difference between the percentage of total read during the analysis and the actual percentage. All in all, we can observe that the MS produces more distortion than the FID against the actual composition of the mixture. The total difference is greater, as is the mean difference for a compound. Finally, the higher standard deviation indicates that this variation is more unpredictable in MS. Other papers abound in the same direction (1,2). MS can also be reliable, but it requires heavier precautions (3) and a good calibration, which is hard to apply for essential oils since they have a very variable composition. It should be noted that neither of the two methods is entirely representative of the composition of the mixture. This can partly be explained by the great range of types of molecules that I have put in my mixture: alkanes, terpenes, phenolic compounds, esters are found together. It is a diversity that is seldom encountered in essential oils. 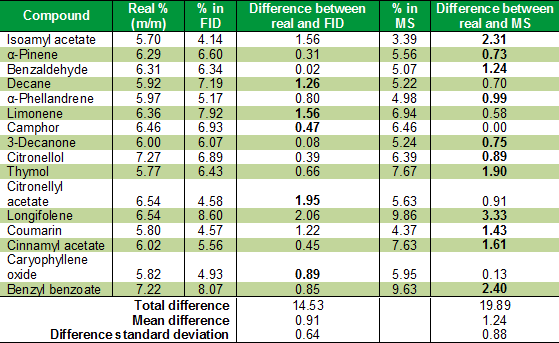 I again stress that the FID is comparatively more reliable than the MS, but that it is not perfect (no detector is). It is used by convention, and to establish reliable comparisons between analyzes. FID detection is recommended over MS by the AFNOR standards, which serve as a reference in the field of analysis of volatile compounds (4). We will see in future posts how we can further improve the results of GC-FID using correction factors, or even better, with a proper calibration. *The response factor constant by means which divide the read by a detector to obtain the amount of a molecule by mass signal. For example, if a 2.0 µg via a molecule detector gives a signal of 50000 units (absorbance of light, electricity, etc. ), the response factor is 25 000 units/µg. (1) Bicchi, C., Liberto, E., Matteodo, M., Sgorbini, B., Mondello, L., of Acampora Zellner, B., Costa, R., Rubiolo, P. Quantitative analysis of essential oils a complex task. Flavour Fragr. J. 2008, 23, 382-391. (2) Cicchetti, E., Merle, P., Chaintreau, A. Quantitation in gas chromatography: usual practices and performance of a response factor database. Flavour Fragr. J. 23, 450-459. (3) Dodds, E., McCoy, M., Rea, L., Kennish, JM Gas Chromatographic Quantification of Fatty Acid Methyl Esters: Flame Ionization Detection vs. Electron Impact Mass Spectrometry. Lipids 2005, 40 (4), 419-428. (4) AFNOR. General Guidance on Chromatographic Profiles - Part 2: Utilization of Chromatographic Profiles of Samples of Essential Oils, ISO 11024-2:1999(F).